Milk & Mode: Time Out New York Features Milk & Mode! Time Out New York Features Milk & Mode! Milk & Mode got it's first bit of press today! 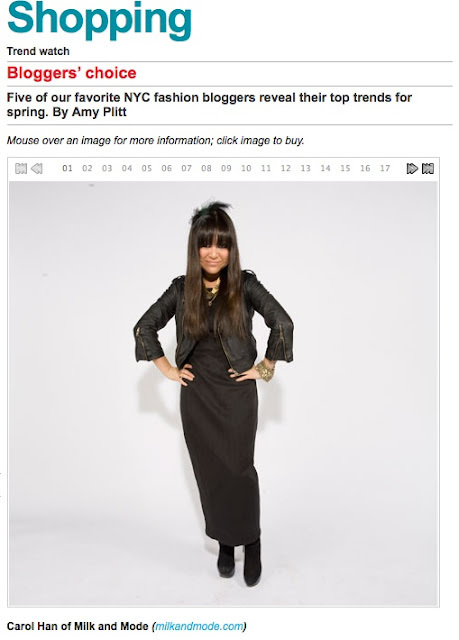 Time Out New York featured us as one of their favorite NYC fashion bloggers. Needless to say, I am seriously flattered. It really brightened a day that I've spent moping around at home recovering from my wisdom tooth extraction, which I have to say, is just as much of a pain as one would think. 2010 does indeed seem to be the year of change, and I can't wait to see what else it will bring. Just saw the article in my Time Out today. Pretty cool! saw the article too, wantd to check out the blog, congrats! !